Home » features, food & beer, washington d.c.
One of these exceptions is De Vinos (www.de-vinos.com), in Adams Morgan. (Its sister store – D’vines, in Columbia Heights – is another.) 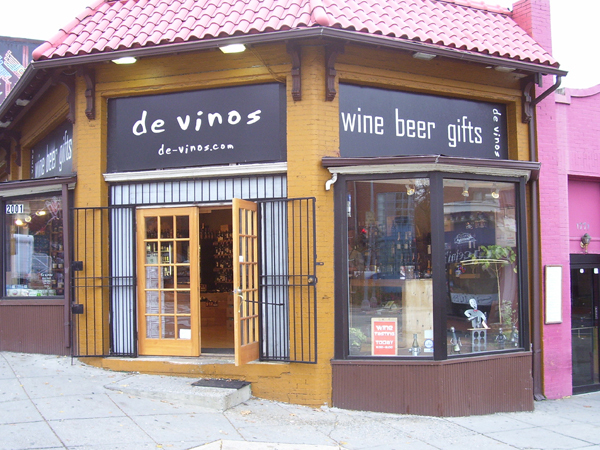 Okay, technically De Vinos is located at the complicated intersection of U Street, 18th Street, and Florida Avenue. But De Vinos itself is simple: Tons of good beer and wine in a comfortable shop – small, but with a lot to offer. George Aguilar and Lorena Wharff came to DC from Guatemala and El Salvador respectively, and ultimately came to the conclusion that the District needed a beer and wine store to fill the gap between the common and the snooty. When they finally settled into Adams Morgan, they had found the right spot. The selection they offer appeals to a wide range of tastes, and Adams Morgan is not lacking in diversity. Aguilar says the goal was to create and inviting atmosphere; “an open ambience,” he says, “but shopable.” So the space – it feels just a bit larger than the average living room – is not wall-to-wall bottles, but breathes, like a small café with one waitperson. And yet they manage to display an extraordinary number of liquid delicacies. The wine selection is generous, as the name “De Vino” should suggest. But the beer choices are just as substantial. The shelf to the left of the entrance displays 150+ varieties, and that’s just the Belgian section. In fact, Belgian beer is De Vinos’ specialty, and the full spectrum of that nation’s brewing output beckons the curious explorer. But just because Belgian beers get the spotlight doesn’t mean the selection is at all limited. One more pleasant surprise awaits the peruser, as a lone tap sticks from the wall to the left of the fridges. Every week or so a different beer flows through the spigot, offering a taste of some new, something different, something of which you might want to grab a six-pack. There is no charge, although customers are encouraged to enjoy the tastes offered by the store, rather than bringing gallon jugs from home. The owners work through dozens of distributors, always looking for new options for their loyal patrons (and who among their patrons has reason to be anything but loyal?). Aguilar says “there’s a little story behind every brewery,” and the crew at De Vinos loves sharing those stories.